Our luxurious homes overlooking Lac Ouimet have access to a private beach, stunning, panoramic lake views, a magnificant Zen Garden, beautiful sunsets and tranquil surroundings. 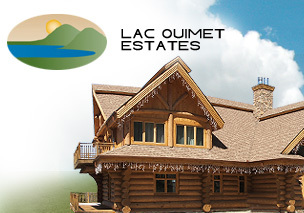 LAC OUIMET ESTATES luxury homes are located on Wheeler Road - one of the most exclusive streets in Tremblant. The seductive notes of fall bring with it a symphony of colour. 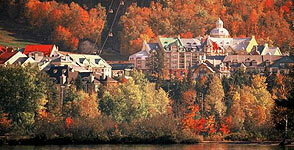 View this spectacle of Mother Nature over the mountains of Tremblant offering you the Grand Prix of colours. The stillness of a snowy wonderland? 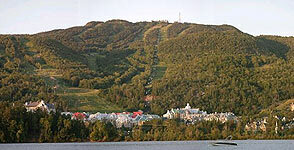 When the mountains are covered by a blanket of white, the village of Tremblant comes alive. 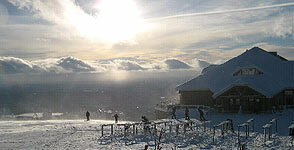 Bundle up and tackle the cross-country trails or ski down the mountain runs. The spring equinox also means a tasty and festive way of underlining the change in temperature. The time is ripe for a spot of bird-watching or a fishing excursion, or you can combine both sports by watching the human fauna invade the terraces, cafes and restaurants! Savour the sweet sunny days of summer in Tremblant. 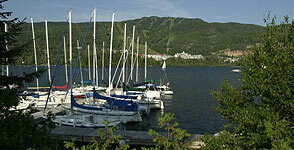 Fresh mountain air, crystal clear lakes and rolling hills as far as an eye can see. Beautiful sunsets and peaceful surroundings offer a perfect escape to tranquility. One of the most distinctive features of LAC OUIMET ESTATES is the Zen Garden. The exceptional Zen Garden and the enclosed pavilion have been inspired by the traditional art of Japanese landscaping. The pavilion blends smoothly into the garden and, like its surroundings, reflects the artistic ideals of Japanese gardens. The Zen Garden provides a quiet area for secluded peace, repose, meditation, relaxation an enjoyment. Its features stimulate all five senses. The Zen Garden is one of the most intriguing features of Japanese culture. The Japanese culture is influenced by Shinto, Buddhist and Taoist philosophies. All these philosophies have been used in the creation of the Zen Garden, giving the Garden a deep spiritual feeling. The purpose of these gardens is to capture nature in the most natural way, and to do so with a touch of artistic flair. Particular attention is paid to plants that flower briefly, as the Japanese consider things that appear briefly and pass quickly to be most beautiful. The essential elements of a Zen Garden - water, plants, stones, waterfalls, trees, and bridges - provide a place for quiet reflection and contemplation. The Zen Garden will sweep you away to an oasis of peace and harmony where each movement is an expression of grace and beauty. The aesthetic ideals of Zen gardens are exemplified by the quest for beauty within graceful limitations and a simple style. It is considered that only “incomplete” beauty is worth admiring, so that the individual has the opportunity to “think it to completion” based on his or her own ideas. The line between garden and its surrounding landscape is not distinct. The two embody each other in that every aspect of the landscape is in itself a garden. Also, when observing the garden, the visitor should not distinguish the garden from its architecture. Gardens incorporate natural and artificial elements and thus, fuse the elements of nature and architecture.